A beautifully designed staircase can serve as the centerpiece of your home. The right lighting will kick things up a notch by providing an elegant and eye-catching effect. A beautifully designed staircase can serve as the centerpiece of your home. The right lighting will kick things up a notch by providing an elegant and eye-catching effect. We have put together some great ideas for the best ways to light your stairs. A dim lit home can feel like a cave. A well-lit home has a positive effect on your mood, and can feel open, cleaner and larger. This not only enhances mood, but also energy levels. A well-lit home is a safer home. It’s easier to see objects and avoid trips and falls when your home has proper lighting. One easy and flexible way to get more light into your home is by using dimmers. Dimmers allow for flexibility. For example, you will be able to have plenty of light during the day, but also have intimacy at night for something like a cocktail party when dimmers are in use. Don’t shy away from using natural lighting to improve the appearance of your stairs. Natural light will make your home feel open and bright. Using window treatments that are more translucent are a great way to do this. Another way to access the natural light that’s readily available is by hanging a mirror opposite a window. Also, when you purchase light bulbs, choose the ones that mimic natural light. Aside from making dark staircases look less creepy, and bringing safety to an unlit staircase, there are other benefits from having properly lit stairs. Effectively lighting your staircase will bring added beauty to your railings and balusters. Whether you have a simple staircase, or an elegant one designed to make a big statement, you can adopt one of many strategies to produce the look that you want. A simple fixture is all it takes to create a brighter, safer and more inviting staircase. Choose lighting that will enhance and highlight the design of your stairs. 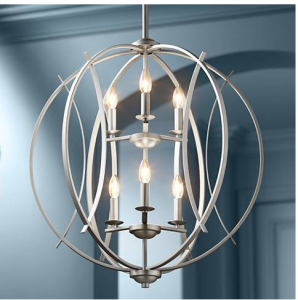 For example, a chandelier like the one below will work well with a more modern stair design. The one rule to follow is to place an ample amount of light at the top of your stairs. Lighting your stairs from the bottom or middle is less effective than from the top. Lighting at the top ensures that your entire staircase is illuminated. Also, don’t forget to light your landing. When it comes to outdoor or exterior stairs, recessed spotlights are an excellent choice. 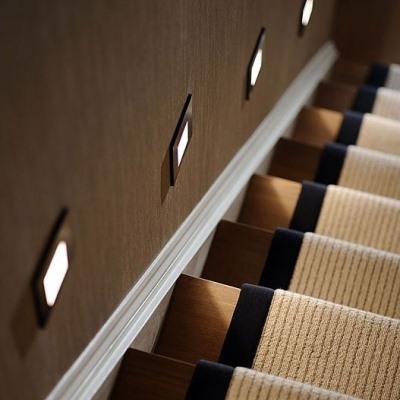 These lights can be used to illuminate each individual stair. Using LED’s are safer, creates an upscale look and can make your space really come alive at night. This technique also works well for indoor stairs. Recessed lights can also be used on the wall near the stairs and will draw attention to the beauty of your railing or baluster. Enhancing the beauty of your stairs with proper lighting can be simple. Safety and elegance can be achieved by choosing natural light and positioning artificial; light carefully and thoughtfully. For more information about the best in stair design and stair parts, Contact Stair Solution today!